When the first TV Spot for Avengers: Endgame dropped, it included all new footage for a small 30 seconds spot. One of the shots included the first look at Rocket Raccoon in the film. WHERE IS ROCKET RACCOON IN AVENGERS: ENDGAME? The character is spotted in a quick shot as he whips open the wooden door to what appears to be a cabin that’s atop a bluff. 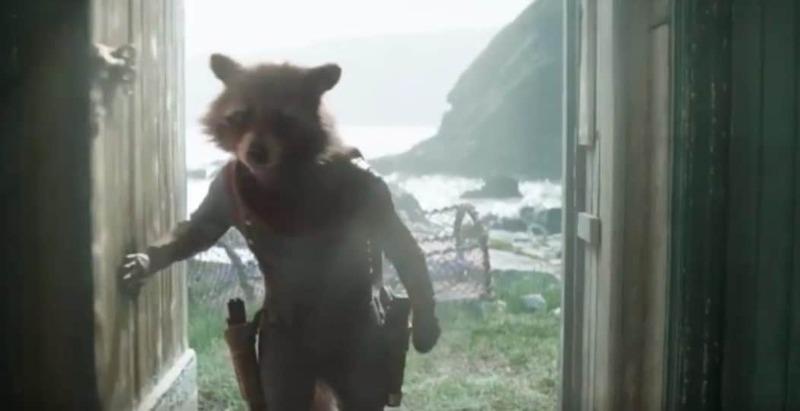 Thanks to eagle-eyed Marvel fans, we know the exact location that Rocket is visiting in Endgame. The production crew assembled a mock tavern in St. Abbs. This is a small fishing village on Southeastern coast of Scotland. The tavern in the set piece is called The Cormorant and Tun. Comparing the shots with the still of Rocket, it’s nearly an identical landscape. This confirms that Rocket is a part of the scene that takes place in the pub. SHOT IN ST. ABBS, SCOTLAND? It should be noted that while filming was underway, the Berkshire Advertiser, a Scottish paper based in the area, reported the presence of Robert Downey Jr., Chris Hemsworth and Mark Ruffalo on location. The paper also mentioned that the production was set to film in Glasgow, Edinburg. There’s a new set of possibilities if why the group has assembled in a pub. They could be coping with the incredible losses suffered in Infinity War. There’s a chance that Thor decided to continue his plans of relocating Asgard to Earth. This could mean that the Cormorant is actually a pub within New Asgard. Avengers: Endgame stars Robert Downey Jr. (Iron Man), Chris Evans (Captain America), Josh Brolin (Thanos), Scarlett Johansson (Black Widow), Chris Hemsworth (Thor), Jeremy Renner (Hawkeye), Brie Larson (Captain Marvel), Danai Gurira (Okoye), Evangeline Lilly (The Wasp), Paul Rudd (Ant-Man), Karen Gillan (Nebula), Mark Ruffalo (Hulk), Don Cheadle (War Machine), Bradley Cooper (Rocket Raccoon). It will hit the theaters on April 26. What do you think MCU fans? Let us know in the comments below.